I emphasized pig each time I tried to convince a friend to join me at Bondir, I love house cured salumi and Chef/Owner Jason Bond has a strong reputation as part of the "snout to tail" revolution. Yet since eating there a month ago, what I recall most are the vegetables and the herbs. Perhaps that is Chef Bond's gift-transforming not just meat, but vegetables, too. We were first served 3 breads that were made in house: a nine grain, caraway current and "The Sea." This final, unusual option was marbled with dried seaweed, squid ink and dehydrated shrimp. I loved the tender crumb of the nine grain and caraway, but will pass on the briny Sea. The menu changes daily and the restaurant offers both full and half portions of their dishes. 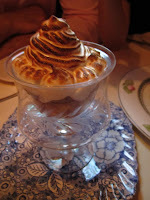 So, we were easily able to try a number of different dishes, plus dessert of course! Our first dish was a light, lemony Garden Sorrel Vichyssoise. The soup itself was lovely, marred only by overly salty smoked soy hazelnuts. A homemade burrata was served with shaved green and purple asparagus, topped with chili oil vinaigrette. I loved the fresh preparation so much that I tried to emulate it at home with fresh asparagus from Verrill Farm. Another favorite of the night, pictured at the top of this post, was their "Root cellar vegetables, roasted and glace with teff polenta and mustard oil." The dish included 12 different vegetables ranging from beets to bok choy to salsify. Each vegetable was cooked perfectly and retained its own uniqueness. Next, asparagus and calaminth risotto with a ragu of Scituate lobster, RI mussels, periwinkles and Mangalitsa prosciutto. The dish was brothy and fresh, full of herbs. The weakest dish of the night was listed as "Garden Herb Pappardelle with braised chicken, Georgia peas, sorrel and ricotta." While the ricotta was wonderful, the pappardelle was tough and heavy. Even more surprising was the chicken that was so overdone it was almost inedible. Ironically, though, our other favorite dish of the night was also chicken. This time it was a roasted chicken breast from Crystal Farms, Pennsylvania. The skin was crisp and chicken was the juiciest I have had. It sat atop Red Russian kale that was as crispy, salty and addictive as potato chips. Below that, tender black lentils and a sweet white flint cornmeal cake. Then lardo glistened on top. Our other main dish was also memorable: Scituate Scallops that were pan-seared to perfection, tender and sweet. We swooned over the morel and mousseron mushroom ragu with burdock root and baby bok choy. Here sweet Cicley, a myrrh like herb was used. The dessert menu was so fanciful that we HAD to try each one. We savoured the cheese: Ascutney Mountain, a raw cow's milk cheese from Cobb Hill Vermont. It was served with a wonderfully bitter Seville orange marmalade and pear leather. The freshly made crostata consisted of a buttery, rich shell enveloping almond cream and braised rhubarb. I adore rhubarb and appreciated that it was kept sour, with a trace of sugar. It was topped with a lemon mousseline that melted creamy streams down the tart. The highlight of the cherry trifle was the meringue brulee. Finally, a chocolate panna cotta, a cross between jello and chocolate pudding, served with rhubarb jelly, cocoa nibs, pistachio and seville orange puree, that fed the chocolate lover in each of us. But Bondir stepped in with one last treat: homemade chocolates, as thin as paper, scattered with pumpkin seeds. It is easy to enjoy a restaurant like Bondir. The atmosphere is homey and the service was attentive without being pretentious. Too, though, the daily changing menu means that a return visit is guaranteed to be full of unexpected pleasures. What a lovely meal! I still haven't had the chance to dine at Bondir. Sounds delicious, I will definitely try this out. What is the price range? Great question. Main dishes are about 30, but you can get half portions for about $16. The appetizers are about $9. My brother and sister-in-law just went and also had a fantastic meal. We are already planning a winter return to eat more pork.